Good Security means doing good basic IT. And sometimes it also means keeping up with new compliance initiatives by industry or government. 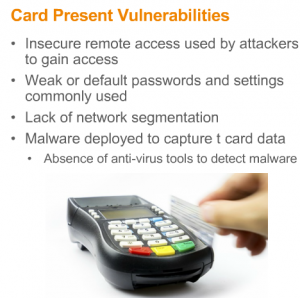 This year October 1, 2015 there is a new Payment Card Industry(PCI) rule going into effect. On October 1st the liability of a security breach will go to the merchant not the bank or processor. Here is an article that discusses certain aspects of the http://news.investors.com/technology/032015-744412-latest-point-of-sale-endpoint-security-tackles-expensive-breaches.htm Point Of Sale system. EMV (the Europay MasterCard Visa credit card standard) will come to the US by October 1st as well. And if you will get new machines anyway get ones which have point-to-point encryption. Malware deployed to capture t card data. If you add a firewall and Intrusion Prevention Systems you will protect yourself even further. Then add the Polliwall, now it will be almost impossible for the standard criminals to take your systems. None of us can defend against the nation states, but if we can defend against everyone else then we have created the defensive system for 2015. Previous article:How to create a more secure Work-home place. Next article:Can you be 100% sure that your network and systems are not vulnerable?